Doctor Aphra #3 may not be a jaw dropping feast for the eyes or a mind blowing story, but it’s fun, and sometimes that’s all that matters. 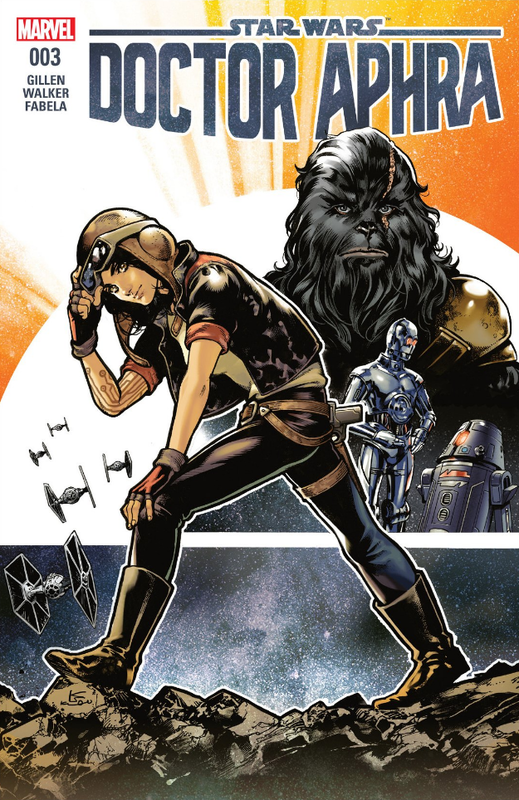 In this issue, Aphra goes on an adventure with her dad to Yavin 4. Sure it’s a reluctant adventure and her and her dad don’t get along, yet the combination works pretty good for storytelling. It leads to fun dialog and situations. Throw in Krrsantan waging a one Wookiee war and you have enough to make this issue worth checking out. 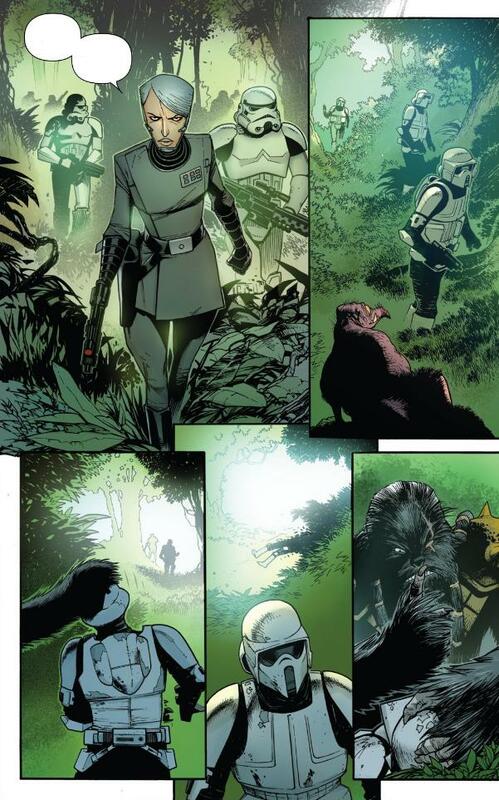 The issue opens on Yavin with Aphra’s father catching up on current events like the Death Star and Alderaan. Aphra figures out a way to infiltrate the Massassi temple despite, or perhaps because of, arguing with her father. To help them accomplish their mission, Bee-Tee and Triple Zero walk right in as they pose as Imperial droids. Meanwhile Krrsantan causes a distraction by destroying every Imperial that comes near him. This allows Aphra and her dad to get in and unlock the mystery of the temple. Unfortunately we don’t get to see what the mystery is as the comic ends just before the revelation is made. While that sums up the story, it doesn’t do justice to the fun that follows. 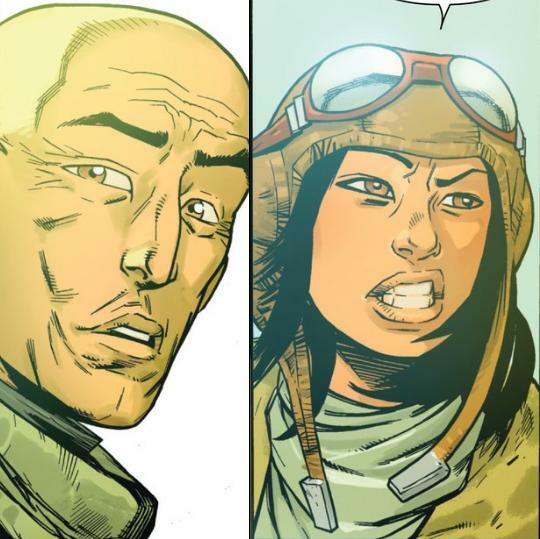 There’s some nice barbs traded, some more character development for Aphra and her dad that really defines the wedge between them, and a new Imperial character is introduced. Krrsantan has most of the fun as the primary source of action. He takes out biker scouts and everything else they send his way. The murder bots are surprisingly peaceful in this issue, but not without their dark humor. The flow of the story adds a lot to the enjoyment. It’s lighthearted, even with the bits of darkness, and it doesn’t take itself too seriously, which I think matches the artwork pretty well. The art and the story have a very comicy feel. However, where that can sometimes be a bad thing, in this case it works. The melding of the cartoony visuals loaded with details and very organic panel arrangements with the witty dialog and fun story bits creates a very enjoyable issue. 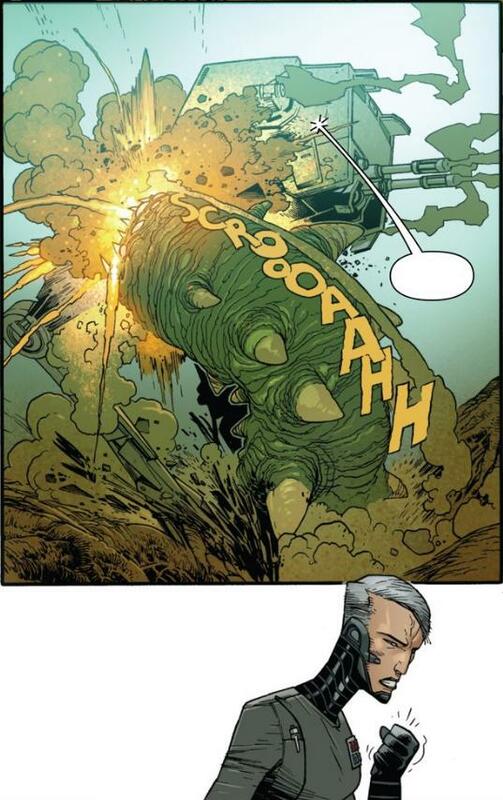 I give Doctor Aphra #3 a four out of five metal bikinis.